Rocco shows Nate one of his favorite tricks, Hide Your Eyes! This week, we're visiting with family in Chicago. And, Rocco and I are getting to experience first-hand all the chaotic happy situations we'll be chatting about Friday, Nov. 28 at the #FueltheHolidays Twitter party with our pals at Zuke's. While the holidays ARE filled with joy and happiness, and LOTS to be thankful for, they also can be a time of stress and chaos that can be particularly difficult for pets, and children. Rocco is typically a very social dog and happy in most situations, but this week I've experienced first hand when it's time to pay attention to pet parental instinct, and know when your pup needs a little peace and quiet. Keep your dog focused and happy by continuing with basic training. Performing sits and downs for treats or some basic hand touches will help keep your dog focused on you and will help offer comfort in their familiarity. Let your dog show off their favorite tricks! In the photo above Rocco gets plenty of treats for doing tricks like Hide Your Eyes, delighting cousin Nate. Rocco and Nate both enjoy box games! Play interactive games. 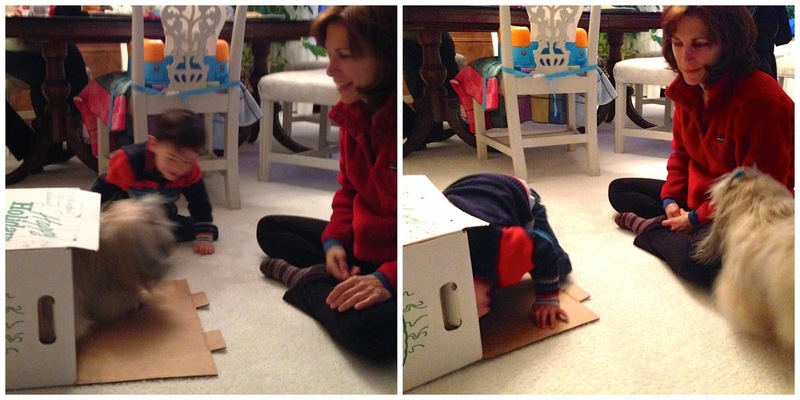 When Nate started to getting a little restless with his own toys, we pulled out a box and played some box games. Both Nate and Rocco are two years old and it turned out they both enjoyed the game. (Funny how kids and dogs at that age respond to the same games! Keep the routine the same. Help reduce stress by keeping your pup's exercise, feeding and play routine as close to normal as possible. That includes having plenty of healthy treats and chews on hand to reward your pup and help keep him occupied. Keep harmful foods, plants and holiday decor out of reach. If you're a guest in someone else's house and you don't have much control over the environment, that might mean keeping your pup tethered to you on a leash. In our case, I also have to scour the entire environment for harmful pills that might have fallen on the floor. Know when it's time for some peace and quiet. Nate and Rocco had a terrific time playing, but like most two year olds, when they got tired and too much rowdiness ensued it was time for a little time out. I could tell when Rocco had had enough and it was time to give him some space and peace and quiet. We have a crate for Rocco to relax in, and he also feels comfortable in my lap away from all the hustle and bustle. Rocco and Nate took turns getting in the box! We all hope you're having a terrific holiday and hope you'll take a little time out on FRIDAY to join us at #FueltheHolidays on Twitter. Start time is noon ET and we'll play for a full 90 minutes! We'd love to hear your tips for keeping pups holiday happy, and of course, there will be plenty of healthy Zuke's treats to win for your own pups! RSVP for #FueltheHolidays and you'll be entered for a a chance to win even if you can't make the party. Hope to see you there! Thanks for stopping by! Happy FitDog Friday! You are very welcome! Happy FitDog Friday! I'm alright with lots of humans around, but mix in a bunch of dogs and I get stressed. Not Bailie, she loves all the chaos which is why she is my PR dog! Have a wonderful holiday weekend! Emma, like you say, it's important to know who you are and what your own doggie strengths are! Thanks and we hope you have a fab holiday weekend too! Thanks pal! Have a fab holiday weekend! Great tips for pet owners. It's the wise pet owner that recognizes that all the festivities can be overwhelming for thie pets and providing a safe haven for them is critical. You've got that right! It's our duty to protect our pups! Thank you! We're not used to having small kids around OR being stuck inside for DAYS of cold, bad weather, so we got to try out our tips first-hand! At home we have our nice home gym full of FitPaws equipment... it's more challenging while out of town visiting.